"Do you have to grocery shop everyday?". Both answers are always a resounding "NO!" When I was in University I had a dorm-sized refrigerator and I swore never again would I live with one milk container filling my fridge and a freezer the size of one ice cream sandwich. So I answer, “No, I shop at Costco.” And the jaws drop. When I chose tiny I didn’t want to stop buying toilet paper every 6 months and I definitely didn’t want to grocery shop everyday. So here’s how I fit Costco in my tiny house. Let’s start with my biggest challenge: 30 rolls of Kirkland toilet paper. A discrete shelf above eye level in the bathroom. I’ve been surprised that no one has ever noticed it. 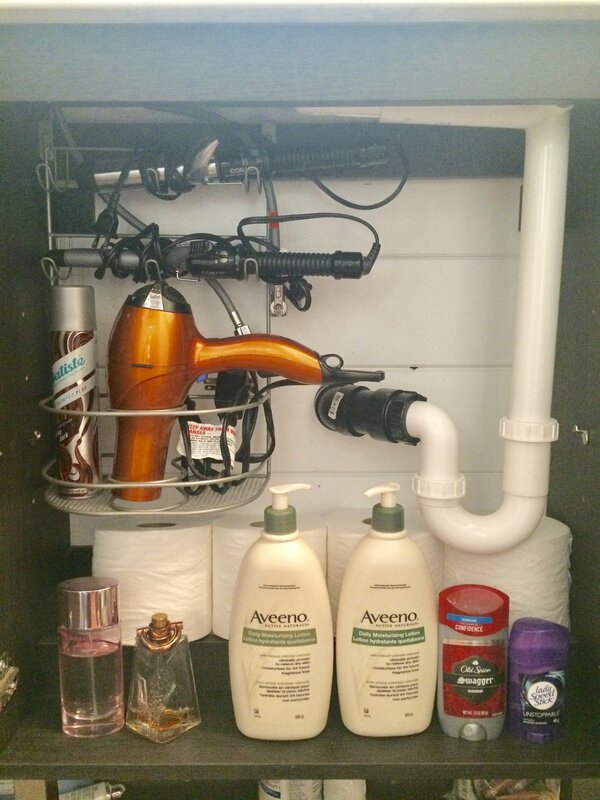 Also, underneath the sink storage and the main key is a storage loft. Many tiny houses have reading lofts, crafty lofts, or guests lofts. I opted for a storage loft and it’s a key component to fitting Costco in my tiny house. You can’t see it, but I have everything from swifter refills to laundry detergent - ALL COSTCO size yet the loft looks great! One of my biggest frustrations when we first starting living tiny was fitting our groceries in our cupboard space. It turns out it’s hard to fit 10lbs of old fashioned oats in limited space. 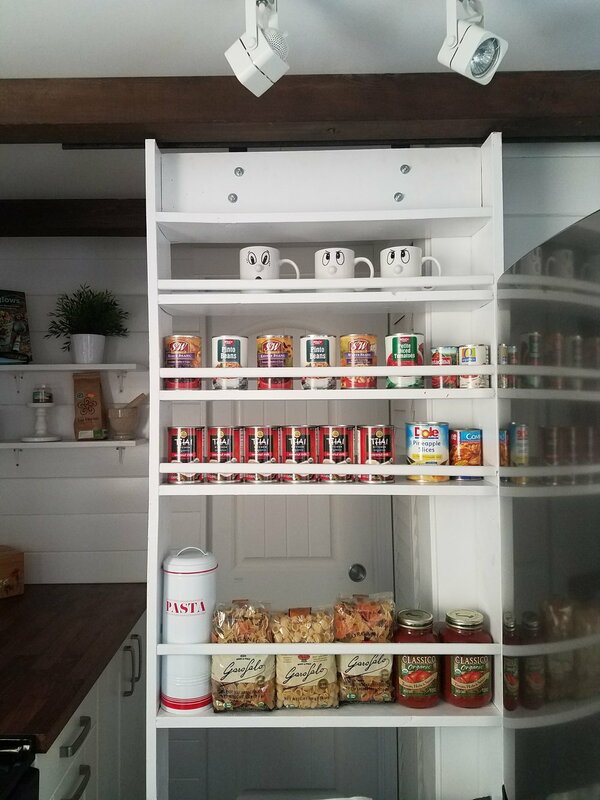 So we decided to add a vertical pull-out pantry and it has transformed my world. See all that food...even in sextuplets (the coconut milk). It was a DIY team WAHL project. We even had to custom make the bearings. This made space in our cupboards. Our fridge choice is key to fitting Costco in my house. It’s an LG 10.1 cubic foott fridge that is half fridge and half freezer. So, no it’s not dormitory size, it’s also not a french-door family size fridge, but it fits bulk: nuts, chia seeds, flax, and hemp seeds in addition to all other household favorites. Cleaning supplies also can be a challenge because they take up valuable space if bought in large quantities, but I only like to shop once a year for such things as dish soap and disinfectant wipes. With two small shelves you can fit 5 containers of disinfectant wipes and a large dish soap and you barely notice. Sounds full - but the house isn't stacked high. In fact, when you look in the front door you don't see any Costco products oozing out. I should mention that what you won’t find is such products as rice and dried beans. I prefer to shop in the bulk section and buy large quantities, but not Costco large. Winco is a great option for choosing how much bulk. Tiny living can be anything you want it to be. Yes, you can’t fit all of Costco in your tiny house you have to choose what you love, but then you can’t fit all of Costco in an average sized home either. You always end up choosing what you love.